Since summer is winding down, that can only mean that Labor Day is just on the horizon. Each year, on the first Monday of September, Americans pause, reflect, and celebrate the social and economic achievements of the country’s workers. Rolex watches have long been symbols of success. It’s common for a person to reward themselves with a Rolex luxury watch to mark a career milestone. On the other hand, companies have also used a Rolex timepiece as incentives for their employees. 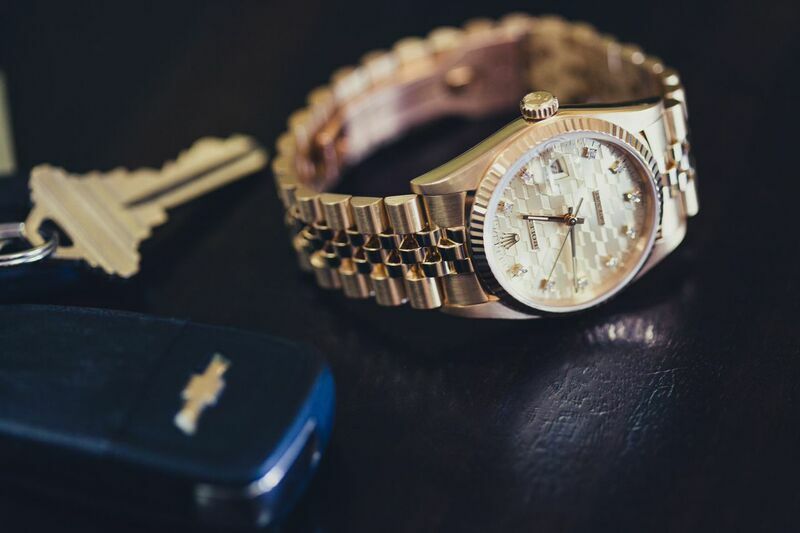 Whether awarded to a colleague that has achieved a specific sales goal, or to a loyal member of staff who has served the business for decades, acquiring a company Rolex watch is a big deal. Here we take a look at three different American companies and the special Rolexes commissioned to commemorate the successes of their employees. The Domino’s Rolex is often confusing to people. On the one hand, a Rolex watch is an expression of luxury and prestige, while the pizza is the most beloved food in America and one that almost anyone can enjoy. However, the executives at Domino’s Pizza understood that a Rolex prize would make hitting a sales goal even sweeter. So the Domino’s “Rolex Challenge” was born. Over the years, the fast-food chain commissioned several different Rolex models, each marked with the company’s logo. 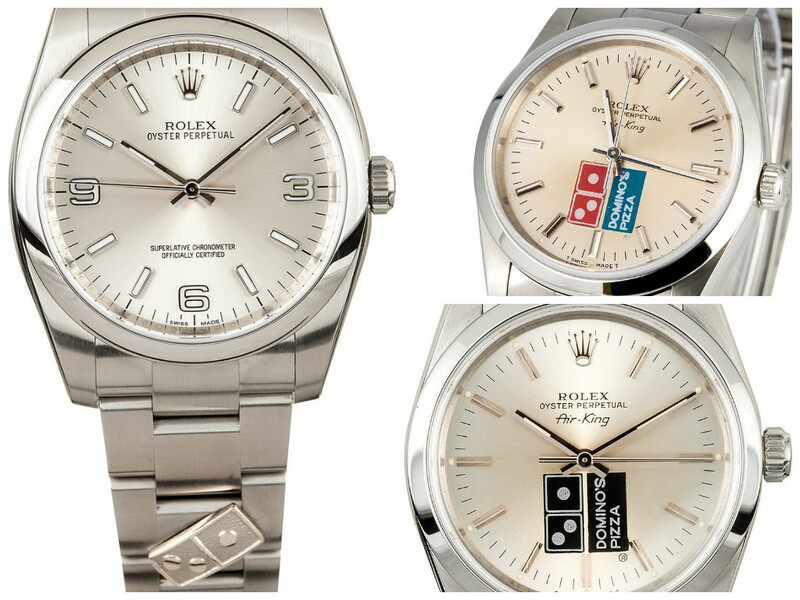 For instance, there’s the Air-King with either the full-color or black and white Domino’s logo on the dial. Or, more recently, the Rolex Oyster Perpetual with nothing on the dial, but instead, a domino piece fused onto the bracelet. In 1986, the mega car manufacturer, Chevrolet celebrated its 75th anniversary. As a result, the company collaborated with Rolex to create a distinct dial to honor the occasion. 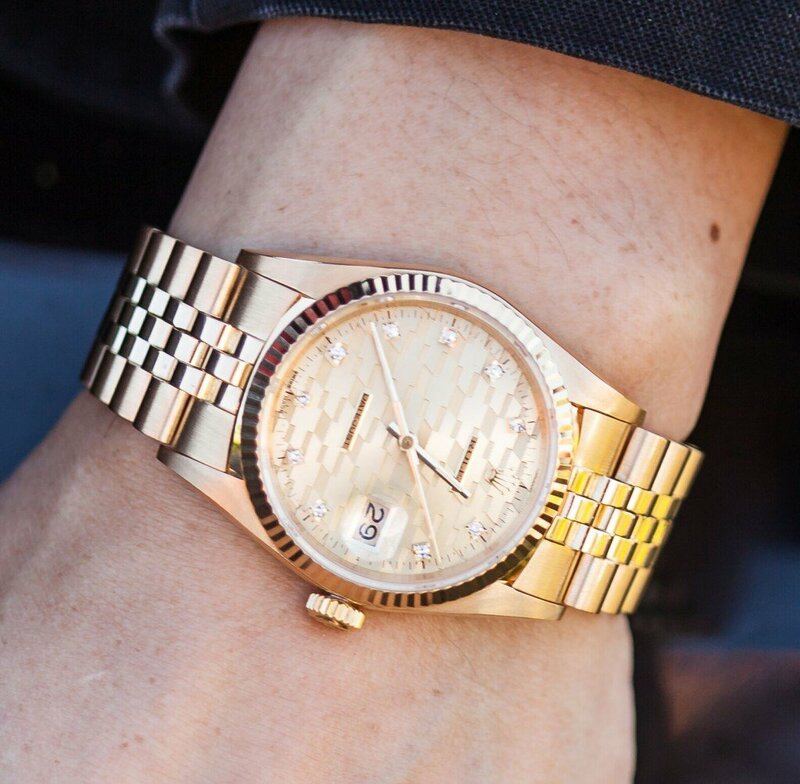 Housed in an 18k yellow gold Datejust ref. 16018, the custom dial featured an engraving of the Chevy logo in a repetitive pattern. Furthermore, since a 75th anniversary is dubbed the “diamond anniversary”, the Chevy Rolex is adorned with ten diamond hour markers. Especially interesting is the lack of text on the face of the watch, which is normally common on Rolexes. In this case, there are only two plates that read “Rolex” and “Datejust” applied on the decorated dial. Since these Rolexes were ultra exclusive, they were only bestowed upon Chevy dealers with exceptional sales numbers. Not to be confused with the GMT-Master II with a “Coke” bezel, the Coca-Cola Rolex refers to the models ordered by the soft-drink giant for company use. As early as the 1950s, Coca-Cola would grant their executives a celebratory Rolex watch after 25 years of service. 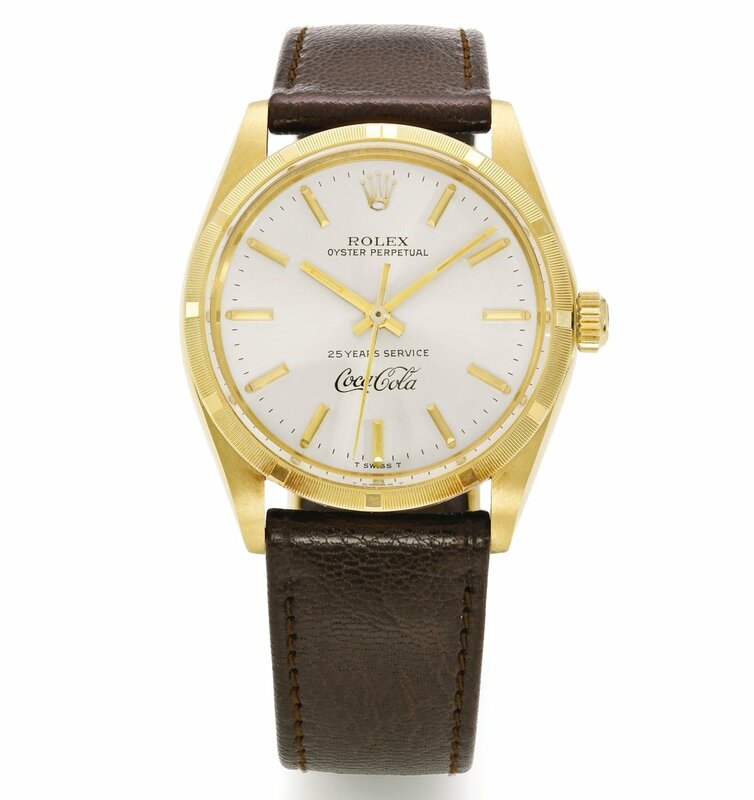 In fact, on the dials of the gold Rolex watches “25 Years Service” is prominently printed above the iconic Coca-Cola logo. This particular Rolex Oyster Perpetual from 1977 features a 14k gold case topped with an engine turned bezel. And the white dial serves as the perfect backdrop for the gold hands and gold indexes. An exquisite company gift indeed.